Previously lost footage from the nineties!!! 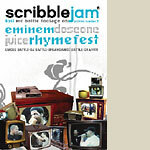 Includes the famous battle featuring Eminem, Juice, Dose One and Rhymefest, plus the entire Scribble Jam 1997, 1998 and 1999 videos. Appearances by Slug, ADeeM, Sage Francis, Eyedea, Brother Ali, PEACE, Cros One, Phase 2, Jaser, Dalek, Emit, DJ Precyse and many more! All elements: Emcee, DJ, Breakdance and Graffiti battles.